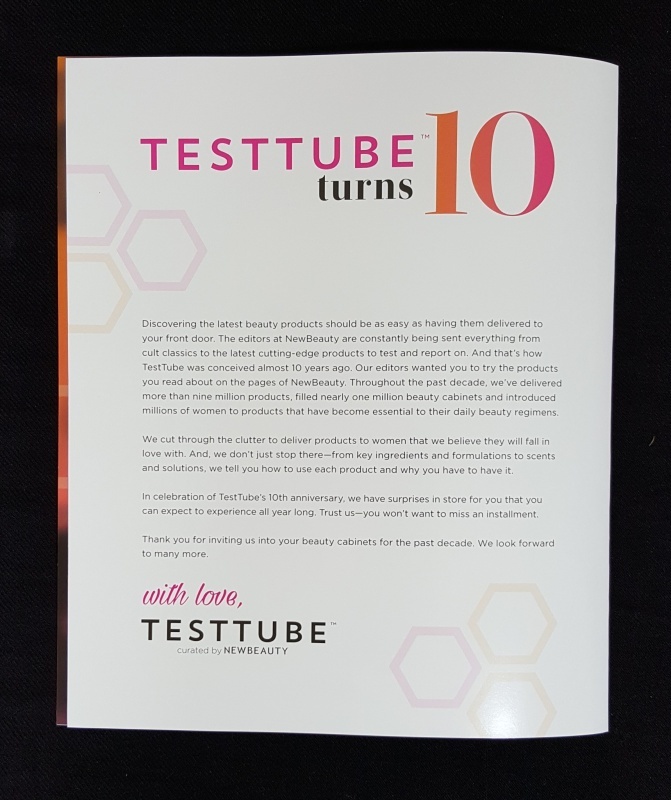 Happy 10th Anniversary to TestTube! 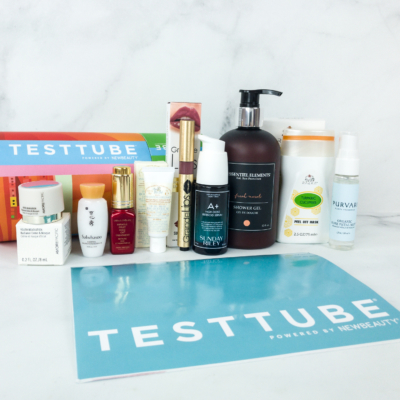 NewBeauty TestTube is a bimonthly beauty subscription box filled with 8 or more deluxe and full-size products with a total value of over $100. When you subscribe you will also receive a subscription to NewBeauty magazine, delivered quarterly. 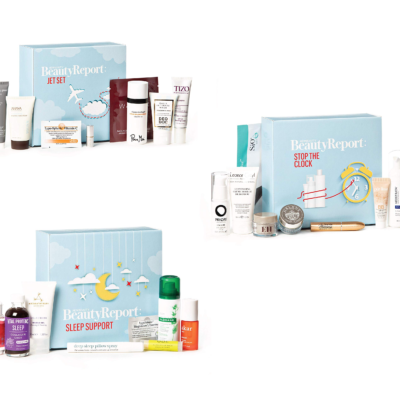 Because of NewBeauty’s heavy focus on skincare and in-office treatments, this box is targeted to more mature women although everyone should care about skincare! 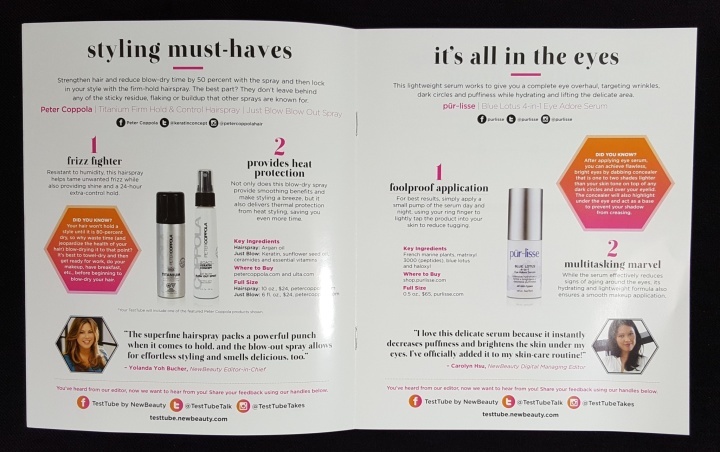 Discovering the latest beauty products should be as easy as having them delivered to your front door. The editors at NewBeauty are constantly being sent everything from cult classics to the latest cutting-edge products to test and report on. And that’s how TestTube was conceived almost 10 years ago. Our editors wanted you to try the products you read about on the pages of NewBeauty. Throughout the past decade, we’ve delivered more than nine million products, filled nearly one million beauty cabinets and introduced millions of women to products that have become essential to their daily beauty regimens. We cut through the clutter to deliver products to women that we believe they will fall in love with. And, we don’t just stop there – from key ingredients and formulations to scents and solutions, we tell you how to use each product and why you have to have it. 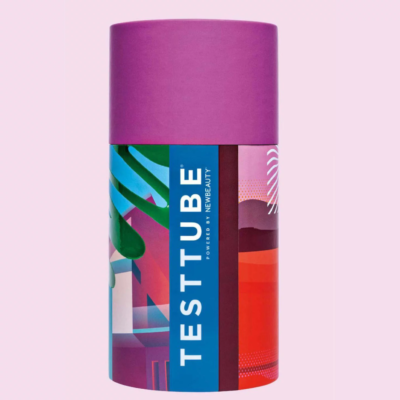 In celebration of TestTube’s 10th anniversary, we have surprises in store for you that you can expect to experience all year long. Trust us – you won’t want to miss an installment. Thank you for inviting us into your beauty cabinets for the past decade. We look forward to many more. All nice and neat inside. Inside the box are the tube, a face mask (yay! ), and information booklet (and all other items are in the tube). The information booklet has details on each item, as well as the reason it was chosen by the editors. SkinCeuticals C E Ferulic ($163.00 for 30 mL): Talk about a wallet-buster! This is definitely on the pricey side. 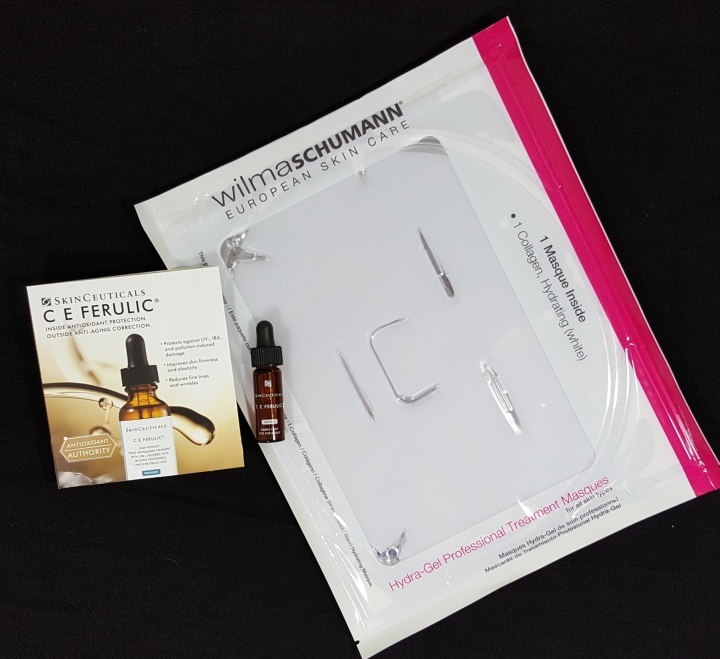 C E Ferulic is a vitamin C serum that delivers advanced environmental protection and improves the appearance skin, giving a more youthful appearance. The formula contains a combination of 15% pure vitamin C (l-ascorbic acid), 1% vitamin E (alpha tocopherol), and 0.5% ferulic. Once absorbed, this vitamin C serum remains effective for a minimum of 72 hours. Since I spend a lot of time outdoors, I like that this provides UV protection. The serum has an herbal scent that I don’t particularly like, but that does dissipate fairly quickly. 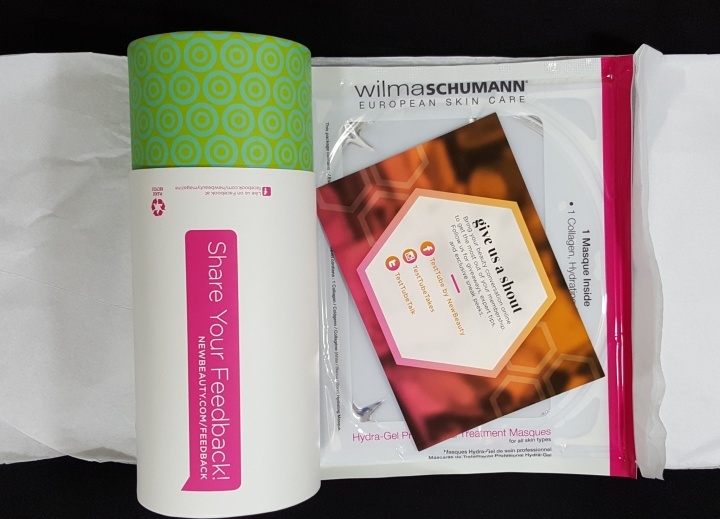 Wilma Schumann Hydra-Gel Professional Treatment Masque ($9.75): I’ve reviewed quite a few masks on Hello Subscription and was excited when I saw this in my box. 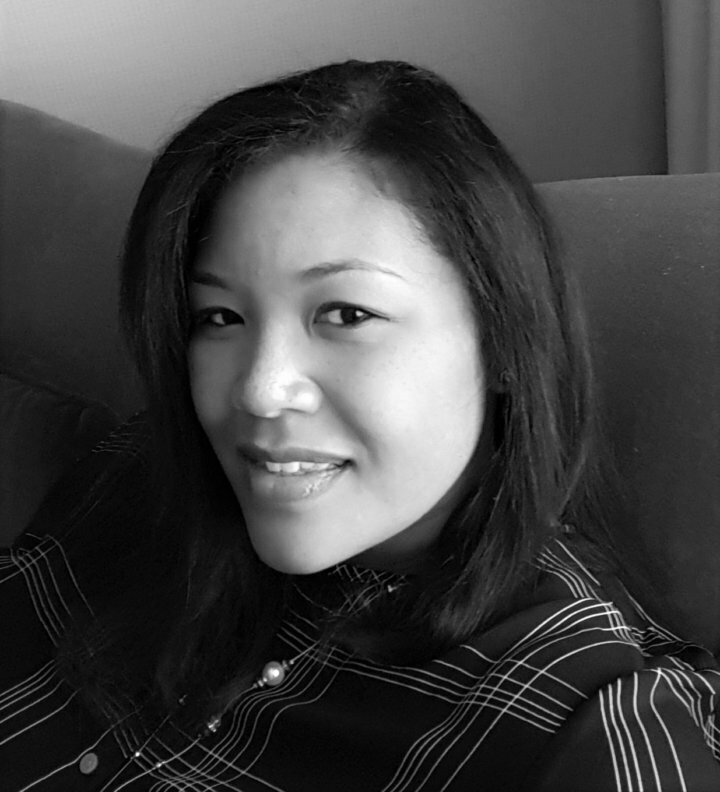 Wilma Schumann has 4 formulations, each designed to target a specific skin concern. I received the collagen for hydration. Collagen, allantoin and hyaluronic acid work together to boost your skin’s moisture, and the mask has a natural rose water fragrance. This is on the list of supplies for my next at home spa day. Lumene Bright Now Vitamin C Day Cream SPF 15 Broad Spectrum ($19.99 for 1.7 oz Drugstore.com): This sample is valued at approx. $5.88. A fresh and moisturizing formula combines antioxidants from Wild Arctic Cloudberry and Vitamin C to make your skin look radiant and bright. They also protect it against harmful external effects, such as sunlight, that causes premature aging. This couldn’t have come at a better time. I’ve just run out of my daily moisturizer, which also has SPF 15. This absorbed quickly without a greasy feel and has a light citrus scent. 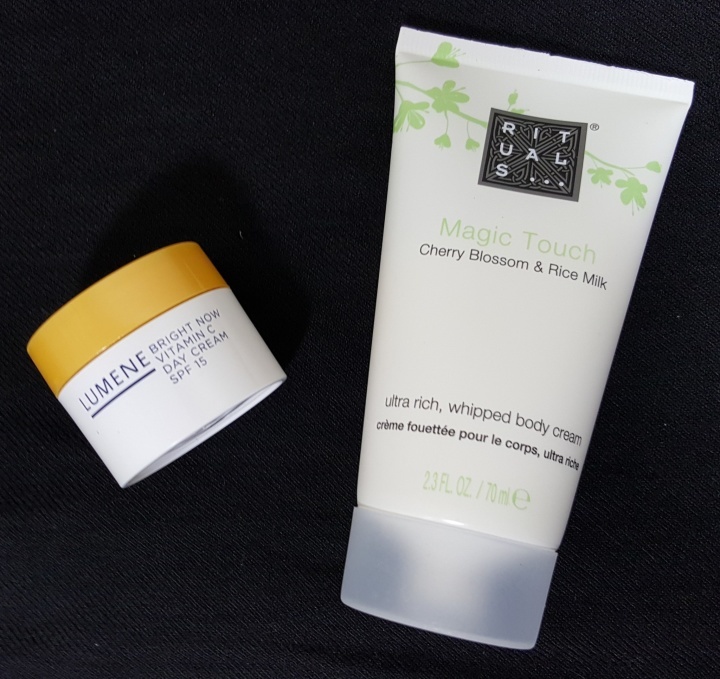 Rituals Magic Touch Cherry Blossom & Rice Milk Body Cream ($10.00): I absolutely love cherry blossom scented creams – one of my favs is here. This has been rebranded and is now The Ritual of Sakura Body Cream. I think this has moved to the top of my list. The scent is not overly sweet, but more floral and long lasting. The formula is a unique blend containing antioxidants, Vitamin E and the ingredient Centella Asiatica, which helps strengthen your skin. This rich cream goes on like a light lotion. It left my skin feeling silky and smooth. 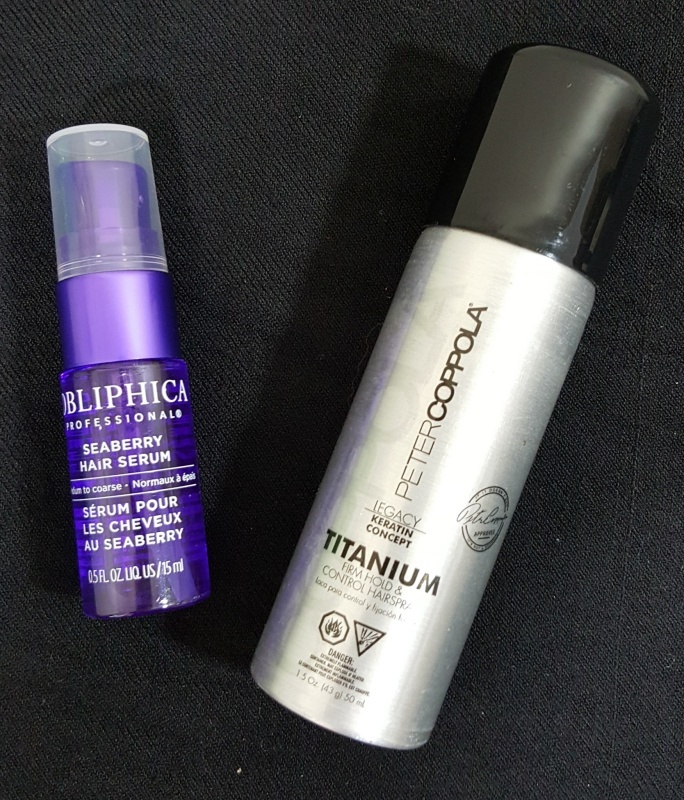 Obliphica Professional Seaberry Hair Serum ($38.00 for 65 mL): This sample is valued at approx. $8.77. It is a rich serum that nourishes and repairs hair, while leaving a luminous, silky finish. Seaberry’s natural UV filters help protect the hair, for longer-lasting color, hydration and shine. I used this after washing my hair, and it left it feeling so soft and smooth, even though blowdrying. It has a soft sugary scent. Peter Coppola Titanium Firm Hold & Control Hairspray ($18.00 for 10 oz): This sample is valued at approx. $2.70. Some subscribers received the Peter Coppola Just Blow Blow Out Spray. I can always use hairspray, and this is a perfect travel size. It promises to be humidity resistant and help tame unwanted frizz while providing shine with a 24-hour extra control hold. pur~lisse Blue Lotus 4-in-1 Eye Adore Serum ($65.00 for 15 mL): This sample is valued at approx. $30.33. Blue Lotus eye serum enhanced with active ingredients like French marine plants, Matrixyl 3000 and Haloxyl bring 4x the power against aging in this intensive eye serum. This proven complex work together against wrinkles, dark circles and puffiness, while hydrating and lifting the delicate eye area. This is just what I need for those mornings when I don’t feel so bright-eyed and bushy tailed. Hada Labo Tokyo Replenishing Hydrator ($17.99 Mentholatum.com): This is a moisturizing serum infused with Super Hyaluronic Acid™. It is a lightweight, fast absorbing formula that replenishes moisture and helps prevent premature signs of aging. The directions say to apply as needed throughout the day, even over makeup. I plan to use this as a toner, after washing my face and before my daily moisturizer. I noticed that you need to wait a few minutes for it to fully absorb. Eau Thermale Avène Thermal Spring Water ($14.00 for 150 mL Drugstore.com): This sample is valued at approx. $4.67. A soothing mist that also softens and calms skin. Florida is very hot and HUMID during the summer, and mists like this are great for keeping my skin cool and hydrated. dr. brandt needles no more ($15.00): A powerful tri-blend of wrinkle smoother that works synergistically in 3 stages to help smooth lines. This cream promises an instant and long term smoothing effect to visibly improve the look of expression lines. I have a super deep wrinkle between my eyes – it’s so bad, it almost looks like a bruise. While this didn’t completely smooth it out, it did make it less noticeable. 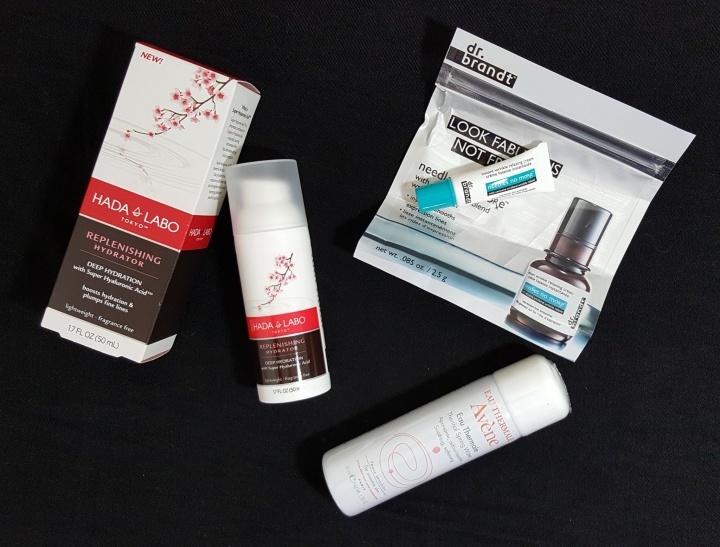 The May NewBeauty TestTube contained over $105 in products – I was not able to calculate a value for the C E Ferulic serum because the sample did not have a size noted on it. While I was hoping for a few makeup items, I really liked the selection of skincare products that I received. Plus, NBTT promises a surprises throughout the year. I can’t wait to see what they come up with next. What did you think of your test tube? Did anyone get different items? And of course, we have coupons! 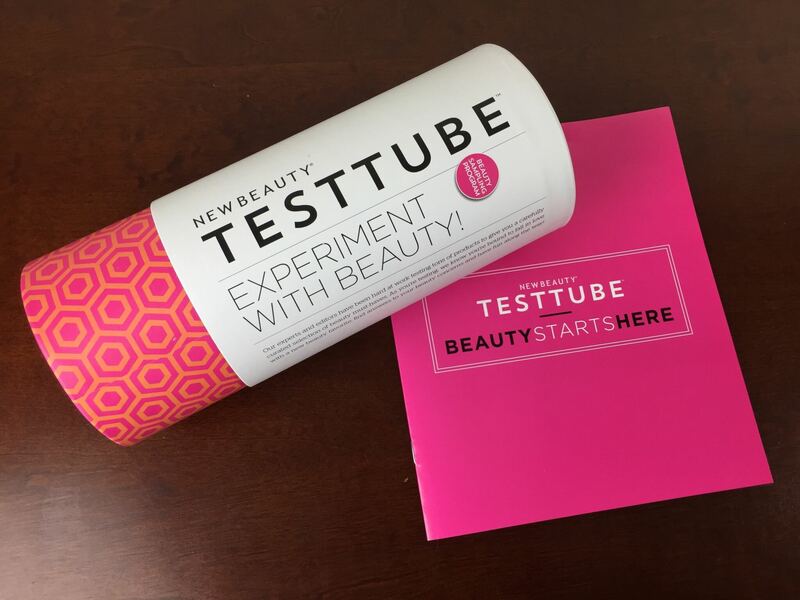 The Description: Six times a year receive a TestTube filled with deluxe and full-size beauty products – top brands, time-tested formulas and targeted innovations. Subscribers receive a subscription to NewBeauty magazine, delivered quarterly. 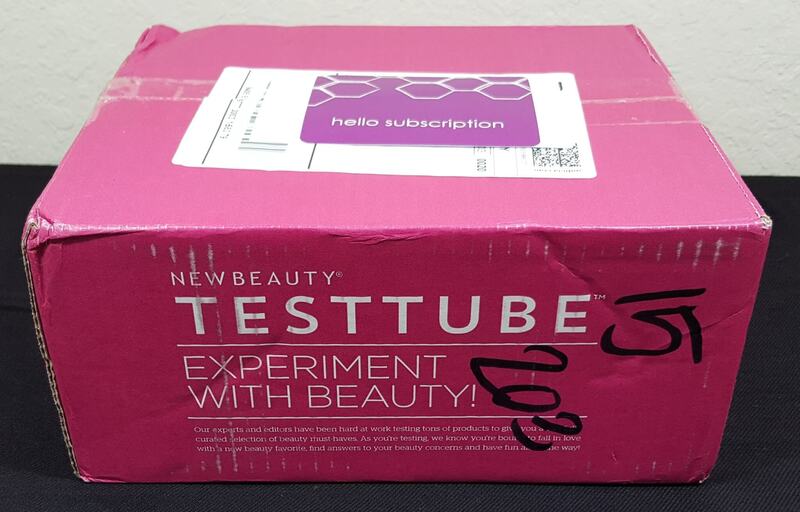 See New Beauty TestTube in the Hello Subscription Box Directory! The Categories: Beauty Subscription Boxes. 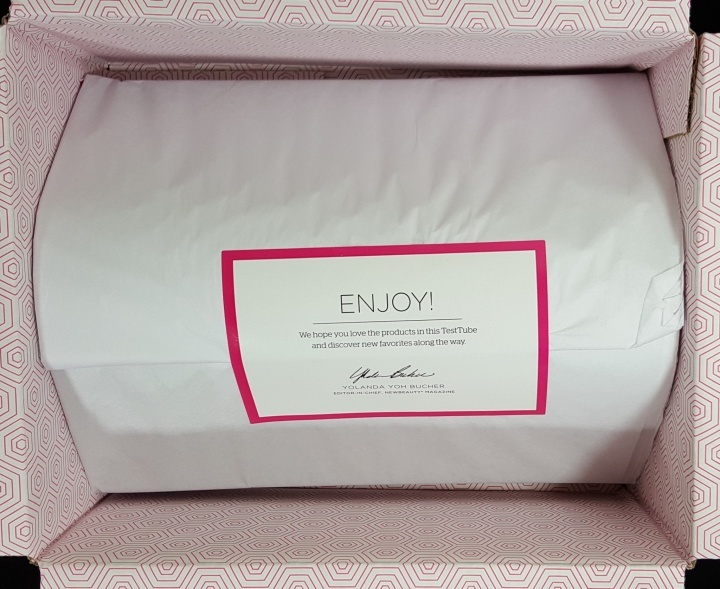 Beauty Sample Subscription Boxes, Subscription Boxes for Mature Women. 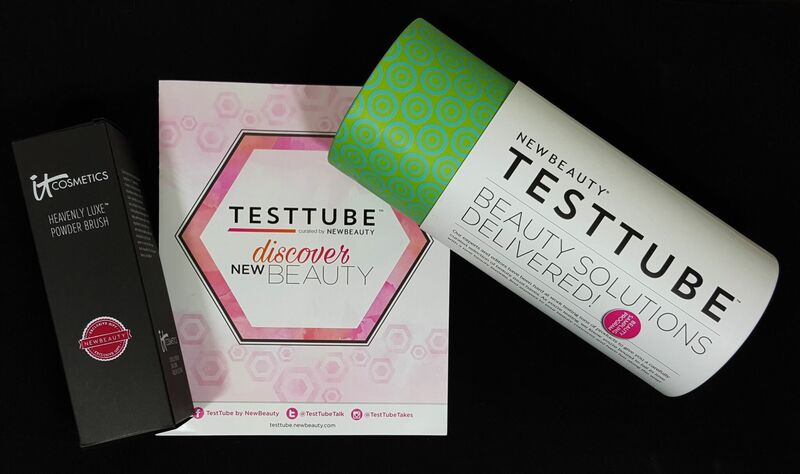 The Reviews: See all our New Beauty TestTube Reviews. 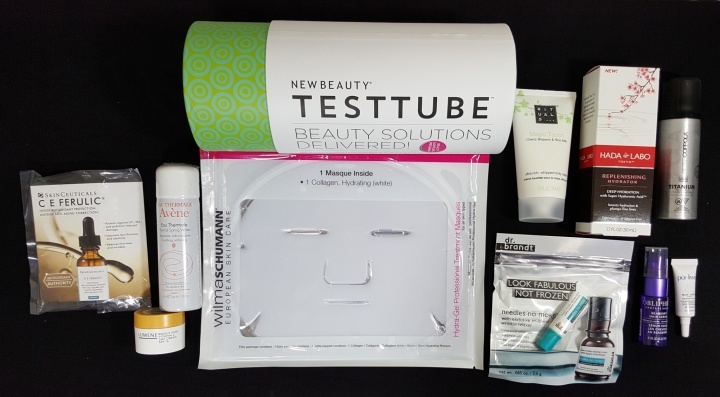 The Spoilers: Check out New Beauty TestTube Spoilers.